Michael Aspel visits Cressing Temple Barns in Essex and among the finds are a collection of ventriloquists dummies, an Italian chair by Bugatti and a watercolour by Russell Flint. Browse content similar to Cressing Temple Barns. Check below for episodes and series from the same categories and more! This week, the Roadshow caravan has come to Essex. for centuries a farming Utopia. Close to the town of Witham stands Cressing Temple - a farm estate that pulsates with history. while in front of me, two of the most spectacular timber-framed medieval barns in Europe. It wasn't any Old Macdonald who made these beautiful structures. They're the work of an order of warrior monks known as the Knights Templar. the poor Templars were gifted tracts of land, and in time became rich and powerful. In 1137, they acquired the estate of Cressing, which they farmed to provide money for the Crusades. and you'll find an oak structure that's stood for over 700 years. It's like a cathedral, with a central nave and side aisles. Its clever construction also solved the problem of supporting a roof over a huge area. Those medieval chippies knew what they were doing. Some timbers here are over 40 feet long. At the end of the harvest, the barns were stacked to the roof with sheaves of wheat or barley. was tied to the roof to ensure good fortune for the next harvest. This one dates from the late 1950s, before mechanisation swept away the tradition. when the horse, the plough and the wagon reigned supreme. and a great house and a walled formal garden was added. the pleasure garden was put to work, providing for the kitchen. Now, things have come full circle and the formal garden has been recreated in the Tudor style. "With sweet musk-roses and with eglantine." That traction engine covered in gleaming brass and traditional paintwork curiously relates to this. Here we have a massive collection of horse brasses and decorations. Why have you got these? I suppose it started in my youth. Father was with horses, so it's one of these things you carried on. -They're a one-off, so that's about it. -So you grew up with them? -You grew up with working horses on a farm. And when they went out to plough, they were decorated. -They'd have a few brass. -They'd always have something on. -Initially they were to protect the horse. A lot of the decoration relates very much to that protective quality. to protect your investment - your horse. Then, bit by bit, that changed into ornamentation. -So the mythology got lost eventually, did it? -but then you went into different counties. -Each county had their own. -Like your Staffordshire one there. -There's a Staffordshire knot there. -There's a leaping horse of Kent. -They're interesting because it's become a folk art tradition. -It links to Romanies and caravans. canal boats - all these symbols are common in that sort of aspect of early-19th-century working life. From early on, there was competition, wasn't there? -Gotta be better than your mate. Brewers were the key operators of dray horses in a decorative sense. -Farming horses couldn't compete with them. -No. Here, we've got the Festival of Britain. -That must be almost the last real horse brass. -There were still horse teams working. -Um, OK, so what do you pay? -Oh, they vary from a five to a tenner each. These good brasses, to me, would be now, sort of, £25 to £50. -so you've got hundreds of pounds, haven't you? -I think it's a great collection. I believe it's a Carlo Bugatti, but I'm not sure. You're correct, it is by Carlo Bugatti. He trained as an architect and was the son of a woodcarver. and this chair is absolutely typical of the style of furniture that we know that he made. and furniture inspired by the Middle East, so Moorish sort of influences. it has vellum - or parchment - panels and tassels hanging down. Then you've got pewter inlay into the ebony there. bound in metal - again very typical of Bugatti - imitating the columns of a Romanesque building. -And all these sources Bugatti was looking at. The high point of his career was in 1902 when he designed a series of rooms for an exhibition in Turin. He won first prize for that - it was very grand, eccentric furniture. that sort of date, and it is an extraordinary and very beautiful example of Bugatti's furniture. -You said you bought it? -Yes, about seven years ago. and I looked round the house and just fell in love with it and said, "I've got to have it." Today, despite its condition, I think it's something that you should insure for £2,000. -It's lovely, a thrilling way to start the day. 30 years ago, when I got married, I saw it in a house in Scotland. -Right, and you put it under your arm and went away with it. -I always thought how pretty it was. -Was that what appealed to you? -On and off, but not reliable. -It's not in a condition to go at the moment. Signed by a Paris maker called Causard. and it actually says on the dial, "Horloger du Roy". In other words, clockmaker to the king. the time of King Louis Philippe, really, we're looking at. Hence he's got "Horloger du Roy" on there. I suspect he may have died by then and it's somebody reviving his name, so it's not the original Causard. Apart from that, it is a stunningly pretty clock. it moves behind there with this wonderful ring of paste here. -That's what glitters and shines - or it would if it was clean. It would look very beautiful when it's going. The rest is lovely blues of porcelain. -what it would look like cleaned up? Would you want it to be? -Yes, I'd love it to be. -but I do warn you, when it comes out, it will be a bright, bright gold in colour. -another 150 years to see it back in this condition. -So that's a warning I give you there. It could be made to go quite well just by having the movement cleaned. You don't have to do the case. It's a personal choice, isn't it? -they mirror the shape of the clock - also lyre-shaped. -Oh, I hadn't noticed that before. well, currently I think it's worth £2,000-£2,500. -Certainly a very pretty clock, and a pity not to see it working. -So maybe I could persuade you to have it done. Fortunes read. Have your fortune read, sir? Fortune? -I don't smoke, thank you. -No, I'll tell your fortune. -You just pick one, any one. 50. Just a minute, let me dip into my book of words by Kwan Ling. Here we go, 5. Right, are you ready for this? -Ridiculous! We're surrounded by them. Ah, Charley Weaver, the bartender, dating from the 1960s, early 1960s. -The nice thing is he's in good condition. -Years ago, I went to a garden fete. -And I picked it up for very little money. -They're quite fun and are beginning to become quite collectable. -I think currently his value's around £40-£50. -But it's going to go up in value, certainly. -and since Charlie's asking, mine's a large one. it had an interesting hallmark, and it's just been dumped in a drawer. of the Russian Imperial family in those days. He used to work in larger scale mainly. such a pretty, tiny, little brooch, very delicate. A lover's knot and diamonds are for "love forever". So you knew what the stones were? Yes, when Dad gave me the brooch, I scratched their mirror in the sitting room right across. -You did a proper job because diamond cuts anything, glass included. -I knew they were real then. Well, I would say that at auction this brooch would probably bring you something between £1,200 and £1,800. -Make it three times as much, £3,500-£4,000. My husband bought them from a boot sale - that one a couple of months ago, and that one about a year ago. ought to be Chinese porcelain from the Ming period, a classic Ming vase from the 17th century. But it's a fake, a copy. But having said that, it's a very early copy. If we look at the base, it's a coarse earthenware pottery covered in a white glaze. -what was then a valuable piece of Chinese porcelain. This was made in Holland in about 1690-1700, copying a Chinese vase of the time. and the painter in Holland has copied the Chinese work exactly. I mean, it really does look like the real thing. It's had some mending around the rim. At some time someone's repaired the top, it was broken a little bit. -Maybe someone made a lamp out of it. -And ended up at a boot fair. -What did he give for that one? -He just saw it as a bit of bric-a-brac, I think. -That's right. Not a bad little find. What about this one? -What was he thinking about, buying this strange pot? -He just liked it, he's got very unusual taste. That's probably why he chose me! He just liked it. -Not a thing of beauty. -But a thing of great age. It's a piece of polished alabaster, a rather simple little jar, the surface wonderfully smooth. -An age that's been caused by being in the ground not just hundreds, but thousands of years. -This would've probably been dug up somewhere in, perhaps, Egypt. when it was found in Victorian times. These things are usually seen in museums and special collections. -there on a shelf in the boot fair. -So, another pound or so? Yeah, I asked him and he said about £1-£1.50 he paid for it. For its age, these don't make a huge amount of money, but even so that's worth perhaps £1,000. Two of this group are real and we have to guess who they are. -Well, there's me. You must be the other one. -Definitely, otherwise they couldn't talk, could they? -Yes, not the biggest collection, but some rare pieces. -Yes, good boy, don't do that again. Thank you very much. Are they local pieces or international? London, places like that, you see. before and up to the war-time, and the man had to give up his clothing coupons to buy shoes. -and he worked along the Norfolk and the Suffolk beaches. I didn't see your lips move. Which is your favourite of this bunch? I can say the rudest things and get away with it. of all British 20th-century artists - Sir William Russell Flint. you love him or you hate him. Obviously, you like Russell Flint. I like these paintings, I don't like his more naked ladies. You've put your finger on it there. but here we've got a beach scene, but I don't see any naked ladies. I see a lot of bathing ladies here in very '30s-looking bathing hats. -I would think this is about 1930, isn't it? What's its history? Did you acquire this or buy it? Mm. Well, whatever people do say about Russell Flint, I always think that he is a master of watercolour. There's no question his technique was extraordinary. -Actually, my favourite part of this watercolour is the sea. and the spray and so on, is brilliantly done. To do that in pure watercolour is incredibly difficult. and I would say, in a sale, you're likely to get £10,000 for this. leg broken, replaced by a broom handle, no-one thought anything of it. When we first visited them, I just thought it an amazing piece of furniture. -To cut the story short, we inherited it, we had it restored and it blossomed. -Where is your family from? -Hungary. We've lived in England six years. When we first look at it, there's a Chinese cabinet. But it's not made in China because these are not Chinese faces. They're a European's idea of Chinese faces, so it's an interpretation. Well, it lasted all through the Victorian period, the 19th century. combined with chinoiserie, was popular at the beginning of the 19th century. It's known as lac burgaute. it does indicate that later period. We look all over and you see this exaggerated cabriole leg form. And this was perfected by a company called Jennens and Bettridge. OK? chinoiserie and lacquer decoration work that we've ever seen. -Anyway, do you use it and enjoy it? -Yes, we keep our passports in it. -We don't want to put anything heavy on it or in it. -Passports are not that heavy. it would certainly cost you in the region of £30,000 to £35,000. got back a photograph and I wet the signature and it didn't run? -But if it had been a real signature, you'd have lost it. But it proved it wasn't genuine. A lot of that goes on, doesn't it? "I'm so much obliged to you for your very kind token of goodwill on my birthday. Winston S Churchill." but he wanted to reach as many people as he possibly could who'd thanked him for his birthday. This goes on all over the place, even royalty. with a picture of the boys, Harry and Wills, "From Charles and Diana." It's definitely in ink, there's a surface to it. You can feel it, you can touch it. But look at this one. and these two are... You can virtually trace them over. Just look at that, absolutely no variation at all. What about secretaries who sign on behalf of great men and statesmen? -and probably any other of the women in his office. -Isn't it illegal, signing someone else's name? but no, it's not necessary. So how can an autograph collector ever know they have the real thing? It's because they come to people like us, and we have seen these autopens before. Charles and Diana nearly always autopenned. It's very difficult not to find anything that isn't autopenned. and it is super-inscribed to such and such a person and then it is normally signed, that's OK.
Are you saying if somebody gets the OBE and receives that document, it isn't the signature of Her Majesty? When you get your knighthood, I assure you she will actually sign it herself for you. -That's what I was getting at. My grandfather's family were all haberdashers and I think probably they were originally haberdashers. I wondered if she had maybe been used as a costume doll to show designs and fashions. No, I think that's highly unlikely. -Can I have a look at her? We're talking about late 18th century, probably around 1770, thereabouts. So they didn't have costume dolls then. They would have been commissioned by the family to wear the clothes of the mother. I don't think this is 1770, I think this is a much later material. -Looks more like 1815 from the design. maybe made of alder, maybe made of just pine and then painted. -Actually quite simple tenon joints. -but not to anybody else other than the child who wanted to emulate her mother. -to give her these rouge cheeks and the sweet little nostrils and the little mouth like that. so someone has probably said, "I'm going to cut her hair, like Mummy cuts mine." There's not much left. and lovely little silk ribbon. that you insure her separately for £5,000. -Yes, they're very difficult to find, these dolls. Anything that has a hole in one end and a button on the other generally tells me - a concealed gun. -That's what it is. How old is it? -So that tells us that he was the retailer of this. who might have been robbed and thought, "Enough's enough of this!" -Particularly in Yorkshire, they're careful with their money. which has got a couple of holes in there. Couple of spare bullets in there, gunpowder charge in there. -Twist of paper, probably, no more than that. You'd probably only need one reload, wouldn't you? -And then the clever bit is that through there is a hole. and when you were ready to fire, you pressed. "Night-night, mugger." -Does he have a name? ..Sorry, I shouldn't say that. -Oh, I like the eyebrows. -Can you do that without moving your lips? Actresses' dressing room at Drury Lane. Rowlandson. Thomas Rowlandson. and, um, he's well known, of course, for his slightly risque subjects, shall we say? Yes, indeed, I think he has done a lot of work, some of them are a little bit saucy. Oh, yes, saucier than this! -Yeah, I haven't been tempted to buy any of those. What's this? You've got another one? -This is the same subject. and, er, subsequently, I came across another one at a fraction of the price. So what are these other ones? Here's another. This is amazing! I don't believe this. -Well, I've got altogether six of them. -That's amazing! I don't believe it. Six watercolours by Rowlandson, all the same subject. You've got at least £3,000 on the one you bought first. -that's getting to about £8,000. I would reckon we've got £10,000 in this lot. and I believe my father-in-law gave it to her on her wedding day. -It would have been in the 1950s and she was his second wife. This is an exciting and beautifully made piece of jewellery. Tiny, but exquisite and hugely refined. -has been engraved in what's called "in intaglio", which means like a cameo but in reverse. and the decoration is as important. But let's talk about the frame. and then lurking here is a little eagle's-head guarantee mark. -That tells me that this is a French brooch. It's French jewellery from 1900. We know that two or three firms were very prominent then. Strangely enough, Tiffany in Paris were working. -Boucheron is a likely candidate to have made this. -The first one I've heard of, the second one, never. No? It was a competitor of Cartier - still running there. Living in this little plaque are gods and goddesses. -The one on the extreme left is Psyche, goddess of the soul and all higher emotions. We know from the little butterfly wings. It's a Classical source. And she's always being tormented by Cupid. by what's called a "putto", a small boy. -and to comfort her in every way she wanted him to. -Right. Appropriate for a wedding day! And you said it! Because all this allegory is building up to something very significant for a wedding day. It's an allegory of love to be given to brides, and a great treasure. How do we value a treasure like this? maybe somebody might go completely mad and give £3,000 for it. and this wonderful garland at the bottom here. "The Pedigree of the Right Hon Henry Fienes Clinton, Earl of Lincoln." So please tell me, why have you got it? but the really interesting one is my eldest son, who is Lord Markham Clinton Nottinghamshire. -Has the Clinton got anything to do with any other Clinton? and then from Ireland to the United States. -That's right. Clinton is quartered with everybody. And, of course, that shows relationships through marriage also. the most elaborate, and I have to say, goodness knows who you're NOT related to, quite frankly! um...having heirs in Warwickshire, Nottinghamshire, all the way down to London. This one is just absolutely incredible - here's the Clinton quarters again. -And with the garter there and these two wonderfully heraldic dogs there. er, King Richard befriended King Connach of Ireland. Um, and he attended his coronation. In fact, Clinton carried the crown. As a result of that friendship, Baron Clinton went to Ireland. -Is it an Irish title...? No, they spread out and there were lots of branches of the family. The Clintons actually fought against the English. -Baron Clinton was killed and his sons fled to America. -in lots of noble families all the way down through to 1862. -Did you know you were related to a president of the United States? I think your grandpa has actually sort of confessed to this "hands across the sea" business. Look at this lovely binding, early 18th century again - priceless. I could easily see it going for £10,000 or £15,000. It's wonderful. -But we wouldn't sell it. -No indeed, but it's such fun, it really is. -We were left them by our great-grandmother about two years ago. -They're really a collection that we share. I know, but eventually you're going to fall out and move away - who's going to have what? Do you each like each piece? -Which is your favourite piece? Do you remember it from a young age? -This would appeal to a child, wouldn't it? with hundreds of rats spilling over one another. and it symbolises good luck. It dates from the late 19th century and it's an extremely nice one of its kind. That's going to be worth somewhere in the region of £300 to £500. and it's taking a bit of fun out of religion, really. There are the two holes to take the cord and they're of different sizes, a large one and a small one. That generally indicates an earlier date if they're different sizes. and worth in the region of £300 to £500. And then a very nice group of a man and woman with a water buffalo. -That is worth again £300 to £500. -What would that be used for? simply to sit there and be entertaining. The bowls - do we have one each? which is characteristic of Chinese. The Japanese used one ring. And a six character mark - "ta Ming Xuande nian zhi". but they're not 15th century. and these date very close to 1700. But the painting is what one might almost describe as sloppy. Not at all characteristic of Xuande painting. I think they're trying to imitate the Ming porcelain of this period. it's not quite come out right. So they're very unusual bowls and I like them very much. I think they're very good. -maybe even £1,000 if you were lucky. So it was a very nice thing to have been left, and I hope when it comes to it, there's no fighting. -It's a cracking little table. What do you know about the table? Tell the family history. we don't know if it came through her first husband or my grandfather. Right. Have you had any idea...? I mean, this is, to both Martin and I, one of the great surprises of the day. So what do you know about it so far to give us something to go on? -It was always an ornamental piece. -It had little sort of snuff boxes and things on it always. These marks look as if somebody's dropped cigarette ashes on them. may be by one of the great names in English cabinet-making. -There are many features about this table... John, do you agree? -..that would suggest Thomas Chippendale. -A piece from his London workshop. -and a very distinct feature - the curve of the three legs. -And the French scroll foot. you'll find very much the same bases there. -One antique dealer said he thought is was John Vile. but these lovely inlays following the top and this starburst in the middle are typical of Chippendale. So the guess, or suggestion, ought to be in the Chippendale direction rather than Vile. -A real star on this show. -So have you had it valued? Do you have an idea? Ten years ago. Well, don't tell us what it was. -£35,000, there we are. Or even £40,000. -This is the best thing I've seen in many programmes. One of the best things ever. it's goodbye from me, and goodbye from him. 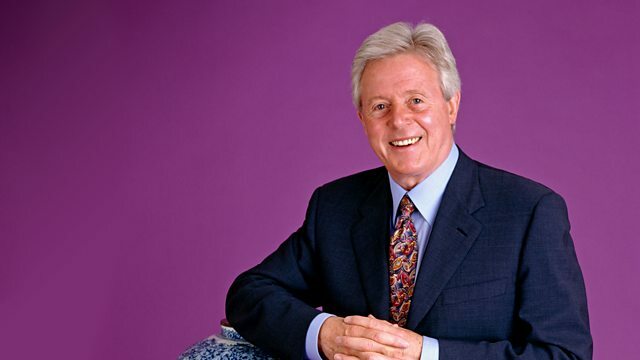 Michael Aspel and the team visit Cressing Temple Barns in Essex and amongst the rare finds are a collection of ventriloquists dummies, an Italian chair by Bugatti, a watercolour by Russell Flint and a Chippendale table.